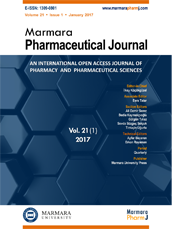 It is with great excitement that the Editorial Board of Marmara Pharmaceutical Journal (ISSN : 1309-0801) wishes to inform you of our recent decision to change our name to Journal of Research in Pharmacy (ISSN: 2630-6344). The decision was made for the reason to furhter increase international representation and recognition of our journal. This change has been on our Journal's agenda and subject to research and extensive discussion for the past two years. In order to ensure continued name recognition and prestige, we will be announcing our former name for the next three years in our website, on all correspondence and Journal volumes. Readers will not have any difficulties to reach our articles with the new and former names. All articles published in the new or previous titles will remain accessible on our journal's website under Institutional Repository http://dspace.marmara.edu.tr. Starting from our first issue of 23nd volume which will be released in January 2019, our journal will be published under the new title, "Journal of Research in Pharmacy". The academic focus of our journal remains the same and continuity is guaranteed. Our title change has already been updated by the ESCI. Coverage of our journal in the remaining indexes such as CAS, EBSCO, Scopus will be updated shortly. We are also pleased to announce that, our journal will increase its publication frequence and will be published bimonthly (six issues annually) starting from 2019. We thank our readers, our authors and reviewers for their interest, support and confidence in our journal.